Os grid reference: SH 7899 5059. In the village of Penmachno, Conwy, stands St Tudclud’s Church, a rather unassuming Victorian building which houses a collection of Romano-British memorial stones. But these stones are now known to be of great historical importance with regard to Wales at the end of Roman occupation (the early 5th century AD). One of these stones recalls Carausius, a young Irishman who migrated to Wales and proclaimed himself emperor of the Celtic west, the other stone is in memory of the cousin of a magistrate, perhaps the first-known person with the title of a court official. The church is located on Llewelyn street, and is dedicated to the little-known Celtic saint, Tudclud, also known as Tyddud. A Roman camp stood close to where the church is – now alas little more than a few grassy earthworks in a field. The village lies 3 miles to the south-west of the A5 road, 4 miles south of the Conwy Valley and Bettws-y-Coed, 8 miles east of Pentrefoelas, and 12 miles north-east of Ffestiniog. In the church of St Tudclud there are five very interesting inscribed memorial stones which date from the late 5th to early 6th century. In particular two of these stones, one recalling Carausius, and the other in memory of Cantiorix are of very specific historic importance. The Carausius Stone is a flat-shaped grave-cover inscribed in Latin to the memory of CARAUSIUS HICIACIT INHOCCON GERIESLA PIDUM or ‘Here lies Carausius in this heap of stones.’ Also inscribed on this stone are the Greek letters “X” and “P” the first two letters of the word Christ (Christos), which here form a four-rayed cross known as a Chi-Rho monagram. Legend tells us that Carausius, also known as Crair or Caron, was the hero of the Britons during the 3rd century AD. He proclaimed ‘himself’ King and Emperor of the Celtic west, and stood up to the might of the Roman army who, in turn, regarded him as ‘something of an annoyance.’ A church was dedicated to him at Tregaron, Gwynedd, because he was regarded as a saint in this part of the Celtic fringe. Another interesting stone has a Latin inscription (on both faces) recalling Cantiorix the cousin of Maglos. 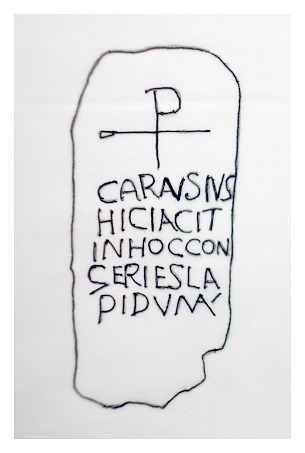 It reads: CANTIORI HIC IACIT VENEDOTTI CIVES FUIT CONSOBRENAS MAGLI MAGISTRATI or ‘Cantiorix lies here, a citizen of Gwynedd, and cousin of Maglos the magistrate,’ The Magistrate Stone was found at Beddau Gwyr Ardudwy near Ffestiniog. It is thought to be the only known example of a person being linked to that of a court official and almost certainly dates from the 5th century. 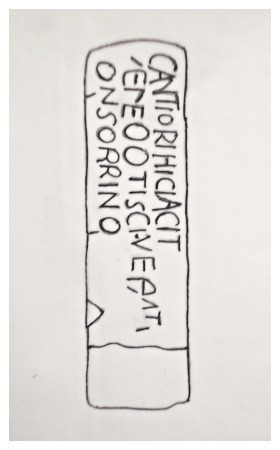 A third stone has the inscription ORIA HIC IACIT which simply means: ‘Oria lies here,’ while a fourth stone reads: FILI AVITORI INTEMPORE IUSTINI CONSULIS or ‘The son of Avitorus in the time of Justinus the Consul,’ which perhaps relates to a consul of Constantinople in the year 540? A large, square-shaped stone has two letters “L” and “R” carved onto it. A couple of these stones were found in the fabric of the church when it was being rebuilt in 1856, but they may originally have come from the nearby Roman camp. The font is thought to be 12th century. A sixth gravestone is of the 13th century and commemorates prince Iorwerth ab Owain Gwynedd (Iorwerth Drwyndwn), who died in 1174 and was the eldest son of Owain, King of Gwynedd. And another slightly more recent slab-stone, maybe from the 8th century, has only an inscribed cross upon it. The patron saint of this church is Tudclud, or Tyddud, a 6th century monk who was said to have been the son of Seithenyn, King of Cantref-y-Gwaelod (the Lowland Hundred), the drowned kingdom off the Cardigan coast. Not much is known about him other than he founded a monastery here at Penmachno and was the brother of St Arwystyl, who was a monk at Bangor Fawr, and St Collen of Llangollen. There is a legend that says King Seithenyn was so drunk one night that he forgot to close the sea-gates and, by the morning his kingdom had been completely ‘lost to the sea,’ according to Nigel Pennick in his very interesting book ‘Lost Cities And Sunken Lands’ 1997. Barber, Chris., More Mysterious Wales, Paladin Books, London, 1987. Gregory, Donald., Country Churchyards In Wales, Gwasg Carreg Gwalch, Llanrwst, Wales, 1991. Gregory, Donald., Wales – Land Of Mystery And Magic, Gwasg Carreg Gwalch, Llanrwst, Wales, 1999. Holder, Christopher., Wales: An Archaeological Guide, Faber & Faber, London. 1978. Pennick, Nigel., Lost Cities And Sunken Lands, (Revised & Updated 2nd Edition), Capall Bann Publishing, Chieveley, Berks, 1997. The Quest for Arthur’s Britain, edited by Geoffrey Ash, Paladin Books, St Albans, Herts, 1976. Categories: Ancient Churches / Chapels, Ancient Crosses, Inscribed Stones | Tags: Inscribed Stones at Penmachno in Wales, St Tudclud's Church at Penmachno in Gwynedd | Permalink. The Carausius Stone is a very interesting find. The Carausius of Roman History was a usurper emperor. During the reign of the Tetrarchy Diocletian and Maximian as Augustus (Senior Emperors) and Constantius and Galerius as Caesar (Junior Emperors) Carausius was appointed to protect the coasts of the North Sea and English Channel. Carausius instead declared himself Emperor (286). Maximian launched a campaign against him (289) but his fleet was defeated forcing the Tetrarchy to come to an informal arrangement (290). However his alliance with barbarian rulers across the Rhine threatened the interests of the Tetrarchy. Military operations this time were delegated to Constantius (293). He defeated Carausius allies and regained the areas of Gaul (France) he had held. However before Constantius could cross over the Channel and engage Carausius forces Carausius was murdered by his Finance Minister Allectus who declared himself Emperor (293). In 297 Constantius crossed to Britain defeating Allectus and retaking the island for Rome. Constantius was the father of Constantine the Great and the rest as they say is history. I recently read the book ‘The Silver Branch’ by Rosemary Sutcliffe a novel which relates to this period and the plot by Allectus against Carausius. It continues the story of the Aquila family which began with ‘The Eagle of the Ninth’ now a film ‘The Eagle’ and ends with ‘The Lantern Bearers’ which tells the story of the end of the Roman Empire in Britain. Thankyou BarryS the comment and info is much appreciated.